The pur­pose of this project is to deﬁne and eval­u­ate col­lab­o­ra­tive agent-based algo­rithms in the con­text of ATStraf­fic re-orga­ni­za­tion algo­rithms in the con­text of ATS. Traf­fic re-orga­ni­za­tion refers to the mod­iﬁ­ca­tion of the traf­fic net­work topol­o­gy to bet­ter uti­lize an exist­ing net­work capac­i­ty. This is com­mon­ly achieved by apply­ing a com­bi­na­tion of road rever­sal and cross­ing elim­i­na­tion oper­a­tions. In the trans­porta­tion ﬁeld, var­i­ous mod­els have been deﬁned in the con­text of urban evac­u­a­tion. 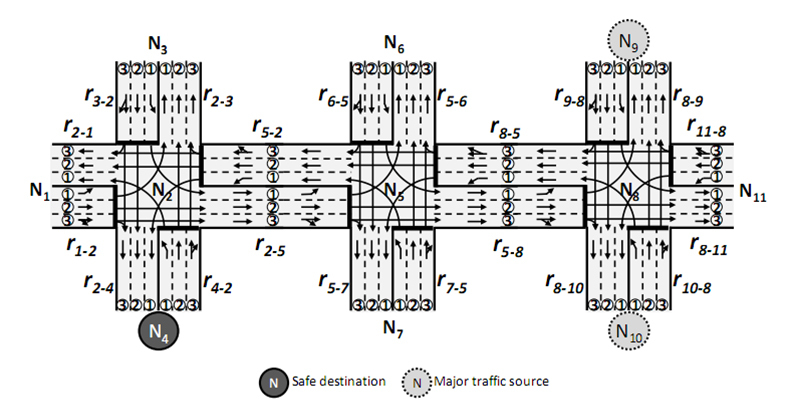 These mod­els are based on the deﬁ­ni­tion of a trafﬁc strat­e­gy then its exe­cu­tion. The main draw­back of these mod­els is that they do not account for the dynam­ic nature of real-world traf­fic net­works. Our research improves on the state-of-the-art by propos­ing agent-based self-orga­niz­ing algo­rithms for traf­fic net­work oper­a­tions that take into con­sid­er­a­tion cur­rent traf­fic con­di­tions. The traf­fic man­ag­er exe­cutes a three-step plan to re-orga­nize the traf­fic envi­ron­ment in an effort to max­i­mize the evac­u­a­tion effort. Based on the infor­ma­tion exchanged with the inter­sec­tion con­troller agents, the traf­fic man­ag­er deter­mines the next set of roads to be reversed. Before revers­ing the direc­tions, it is nec­es­sary to emp­ty roads from traf­fic and pre­vent new traf­fic from enter­ing. This respon­si­bil­i­ty is del­e­gat­ed to inter­sec­tion con­troller agents who adapt their traf­fic con­trol strate­gies to min­i­mize the time required to clear the roads marked for rever­sal. Once the roads are emp­ty from traf­fic, road rever­sal oper­a­tions are applied. Moham­mad Al-Zinati and Rym Wenkstern. An agent-based self-orga­niz­ing traf­fic envi­ron­ment for urban evac­u­a­tions. In Pro­ceed­ings of the The Six­teenth Inter­na­tion­al Con­fer­ence on Autonomous Agent and Mul­ti­a­gent Sys­tems, AAMAS ‘2017, May 2017.